When I left my house on Saturday morning I wasn't planning on ending up at a rodeo. Buuut that's what happened. Almost everyone else was in plaid, denim, and cowboy boots and wondering what was up with the crazy girl in the long dress. 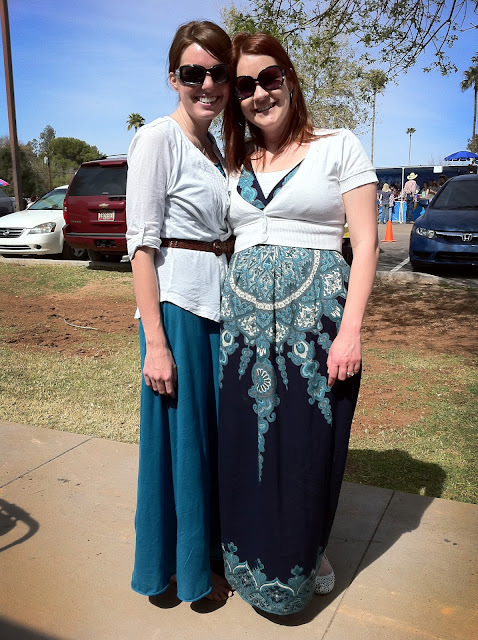 And then my dear friend Crystal showed up also in a maxi dress. She just had a baby and she was looking fabulous and it made me feel all justified in my clothing choice. Excuse the horrific lighting, but we had to take an iPhone picture for my blog. Because that's how we roll. I also wore a black Gap maxi dress on Saturday night and this pink one to church on Sunday. Wearing more skirts and dresses is my Spring wardrobe goal. They're so comfortable and I always love the way I look. I'm on the hunt for breezy, casual type dresses and skirts (I want the one Janssen was wearing in her post yesterday!). I think I'll probably end up making a few skirts with my vast and underused fabric stash (good skirts are surprisingly difficult to find). What are your spring wardrobe goals? Anyone up for a skirt sewing party? It was good to see you at that rodeo on Saturday. I thought you looked fabulous in your dress. Crystal looks great as always too. Maybe the rest of us were under dressed :). I have a few of those long dresses from target but I'm not really sure how to wear them except for a white t-shirt under them. I'd be up for a skirt sewing party. You have multiple maxi dresses? So jealous right now! I was most excited for the 30 for 30 to end so I could get me a maxi dress ASAP. I love how you styled one casual and one dressy. Looks great! oo loving your rodeo attire! and your friend looks AMAZING post-babe. These dresses are so cute on you! i have that blue target maxi dress too (thrifted though, i'm way cheap. way.). we should do a how i wore it/how she wore it post. it would be fun. think about it. think hard!